I have an extensive library of books about data visualization. I purchase most of the books that are published on the subject, but only occasionally do I find one that exhibits sound thinking and deep understanding. 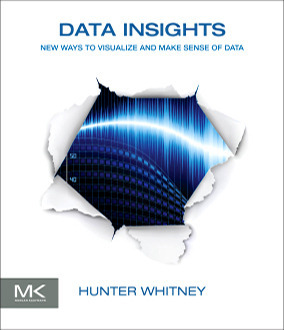 The new book titled Data Insights: New Ways to Visualize and Make Sense of Data, by Hunter Whitney, is one of those rare exceptions. Unlike most authors of books about data visualization or the broader topic of business intelligence, Whitney thinks clearly and writes beautifully. The two go hand in hand. Because data visualization has soared to great popularity in the last 10 years, publishers now give book contracts to anyone they believe will command an audience, with no concern whatsoever for the author’s expertise or the soundness of their content. If you have a blog with an adequate number of monthly visitors, you can find a publisher willing to sign you as an author. (The recently released book by Wiley Press, Data Visualization for Dummies, written by the independent SAP consultant Mico Yuk, is an example of this.) Gone are the days when publishers had standards for content and they approved book proposals on the basis of more than revenue projections. Fortunately, in the midst of the growing noise, signals in the form of a few good books still get published from time to time. Whitney has developed deep expertise in data visualization in particular and user interface design in general over many years of experience. He’s smart, informed, and a skilled communicator. His knowledge is interdisciplinary, including neuroscience, which enables the broad perspective that’s needed for insightful data sensemaking. Unlike many who claim expertise in this arena, he understands the proper uses, limitations, and opportunities of technologies, as well as the needs, weaknesses, and strengths of humans. His knowledge has been forged through the process of building solutions to real problems. From our latest purchase decisions to global population trends, data of all kinds are increasingly swept up and carried along into ever-expanding streams. The surging flows are often so fast, and the volume so massive they can overwhelm people’s capacities to distill the essential elements, derive meanings, and gain insights. We invent tools to solve problems, accomplish tasks, and augment our abilities. We’ve devised instruments to see distant stars and view subatomic particles; now, people are creating new ways to peer at multiple layers of data that otherwise would be invisible to us. Visualizations offer a way to extend and enhance our innate powers of perception and cognition and get a “grander view” of the world around us. However, no matter how necessary these visual representations might be or how reliant we’ve become on them, they don’t tell the complete story. The processes that go into making the visualization, the parts you don’t typically see, are still key components of the picture. The more you know about what goes into making a visualization, as well as its relative strengths and weaknesses, the more effective a tool it can be. Technology enables us to interact with data on more levels to accomplish objectives ranging from completing simple day-to-day tasks to solving long-term, seemingly intractable problems. Visualizations help us transcend the jumbles of data, allowing us to see more of the stories life has to tell. Whitney takes the time that’s necessary to express his ideas clearly and fully. He doesn’t write like a PowerPoint presentation of bullet points, but weaves together the full set of words and images that are necessary to communicate his thoughts effectively. Not only does Whitney write well, he’s also designed a book that supports the principles of design that he advocates. The book is beautiful. Whitney and I don’t see eye to eye on every single detail, but our disagreements seem inconsequential. If the publisher had asked me to review this book in advance, I would have suggested few improvements. Only two recommendations come to mind offhand. First, Whitney interviewed prominent representatives of a few data visualization software vendors and included their thoughts in the book, which were often insightful, but in a few cases examples of their products that were shown exhibited design problems that actually conflicted with Whitney’s recommendations. This underscores the fact that few vendors in the space do a good job of supporting effective data visualization practices. Second, many of the images that appear in the book as illustrations don’t add enough value to justify the space that they use. They’re examples of images that one might show on PowerPoint slides during a presentation just to have something relevant on the screen while covering particular content that doesn’t really need a visual, rather than temporarily blanking the screen. This causes little harm in a live presentation, but waste’s paper and inflates printing costs in a book. No other recommendations than these two are worth mentioning. This is a fine book that adds real value to the field of data visualization. I recommend it highly to anyone who wants to become a skilled and effective practitioner. Thanks for the recommendation, I will surely check the book out. Thank you for the review and recommendation. Also thankful for the preview that Amazon provides. After reading both it was an easy decision to make the purchase and I look forward to reading the whole book very soon. This book comes at a timely period. Working with non-data managers who have caught on to the popularity of “data visualization” without true understanding has been a growing challenge. This will help my team and I to better understand the managers misunderstandings and expectations while attempting to develop and communicate improved data visualization for their use. Koen – I thought exactly the same thing when I checked out “Data Visualization for Dummies”!